Aomori Prefecture is the northernmost prefecture on Honshū and faces Hokkaidō across the Tsugaru Strait. It borders Akita and Iwate in the south. Oma, at the northwestern tip of the axe-shaped Shimokita Peninsula, is the northernmost point of Honshū. The Shimokita and Tsugaru Peninsulas enclose Mutsu Bay. Between those peninsulas lies the Natsudomari Peninsula, the northern end of the Ōu Mountains. The three peninsulas are prominently visible in the prefecture's symbol, a stylized map. Lake Towada, a crater lake, straddles Aomori's boundary with Akita. Like much of Tōhoku, the Aomori region remains dominated by traditional industries such as farming, forestry, and fishing. Hirosaki Castle is most beautiful in spring with the cherry blossoms. Aomori produces more apples than any other place in Japan, especially in the plains of Tsugaru at the foot of Mount Iwaki. In spring they are pollinated by hand and later covered in bags to grow unharmed. Right after the war, one of the most popular aongs in Japan was the "Apple Song" and people used apples to sweeten a lot of food. Then bananas, strawberries and other fruit came to the market and Aomori apples lost some of their appeal, but later recovered when the type FUJI was marketed. 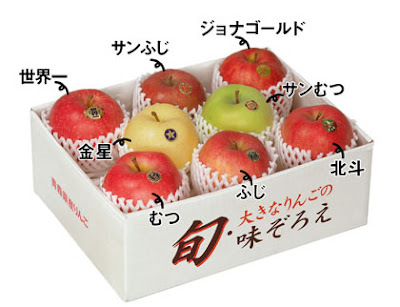 beni tsugaru 紅つがる "red apple from Tsugaru"
The fruit is oblong, without crowning. The flesh of the apple is creamy white, very juicy, lightly flavored, and moderately sweet. It has low acidity and very little browning. This was often prepared during the war when people did not have enough rice to feed the children. "Pedigreed apples" are shipped with a detailed cultivation record. 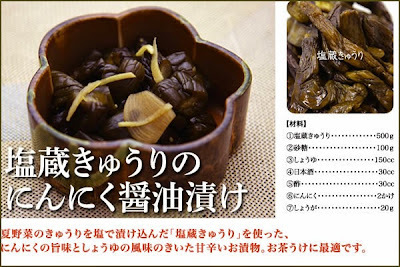 Includes all the local dishes which the author had loved, especially thin bamboo shoots (nemagaridake 根曲がり竹). Herring and scallops boiled in soy sauce and many other delicacies. Dazai Lunchbox was made in the year 2009 to celebrate the 100 birthday of Dazai. On the second sunday in January (formerly it used to be the 15th, the "small New Year Day". 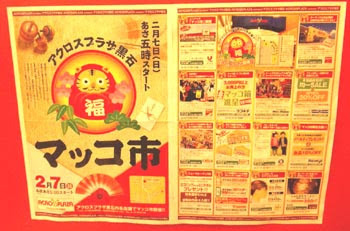 Almost all stores in the town of Kuroishi give a special packet to the customers. The sales start at 5:30 in the morning, to give people time to go shopping before going to work. The people of Aomori eat the most bananas in Japan. they do not taste like bananas, but are made of white anko. It is placed in front of the grave during the o-bon ancestoral festivities. Sometimes the whole family sits on a straw mat in front of the grave and all eat from the lunchbox after it has been offered to the ancestor's spirit. The scallops from Mutsu bay have a special clear and delicous taste. ichigo-ni, ichigoni いちご煮 "boiled strawberries"
The name of this stew comes from its color. Sea urchins and abalone are put in hot water or a dashi broth and brought to a boil. It is seasoned with salt and a little soy sauce, and sprinkled with finely chopped green shiso leaves. The pink of the sea urchin is thought to evoke the color of strawberries in the dawn mist. 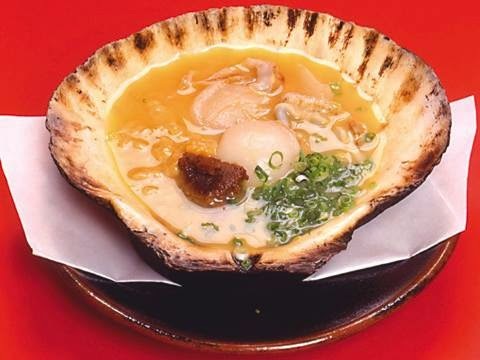 It is usually eaten on formal occasions along the coast of Tohoku. made with sugar and is pink inside, because sweat vinegared pink ginger (beni shooga 紅生姜) is chopped finely and put inside. 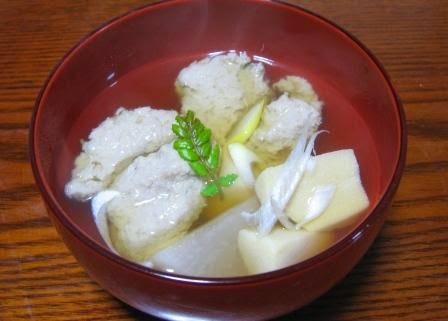 Jappajiru is a traditional winter dish that is highly popular among the locals. 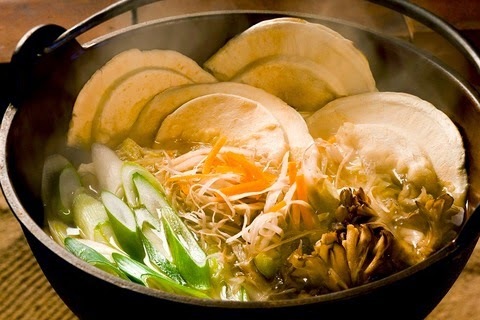 It is a one-pot dish (the variety called in Japanese 'nabe'), in which all the parts that get usually thrown away when cooking fish such as the head, bones, skin, and entrails are cut to the easily eatable size and cooked together with vegetables. This dish is a true gem of the wisdom of people of Hirosaki, who really know how to put whatever is at hand to the most effective use. The rich broth made with the head, bones, and skin of the fish is gives a taste so thick and rich, one simply cannot create if only the meat of the fish is used. The soup is thickly seasoned with salt and bean paste, and is savored together with the bones covered with fish meat, which is said to be the most delicious part. The peculiar name of the soup, Jappa-jiru, is said to derive from the word 'zappa' that is used to describe the unnecessary parts of the fish, while 'jiru' or 'shiru' mean soup. fried in a pan with beaten egg, dashi soup stock and miso paste. Sometimes fish is added. It is very healthy and was served to sick people in former times, where eggs were considered medicine. Served in a scallop shell it is most decorative. Well loved in Shimokita and Tsugaru. 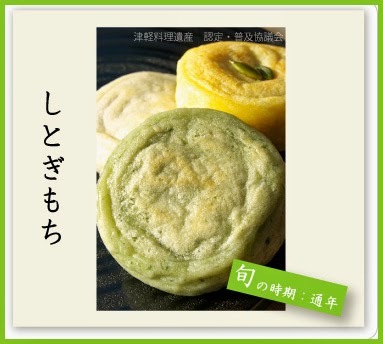 Rice flour is made into a white dough, inside the round balls is azuki sweet bean paste. It comes as a soup, with a bit of soy sauce, flavored with konbu and shiitake mushrooms. From Tsugaru peninsula. Radish, carrots, goboo burdock, bracken, tofu and konnyaku are cut in small pieces and simmered in miso or soy sauce until a thick soup is done. Yakiboshi sardines are used to create a delicious dashi broth. This dish is prepared in great quantity in a big pot and can be re-heated many days. It was originally made by the housewife for the family to last while she was gone to visit her parents during the New Year period. Also a speciality of Akita. to be eaten with hodgepodge, it is easier to grip with chopsticks. It is all white in Aomori, because it is made from konnyaku flour. There is a factory with a special maschine to bind these knots into the noodles. Started after the war as a snack for children.With rather thick, flat noodles 太麺 and a sweet hot sauce. Fruit juice is used in the sauce. Started in Showa 30, when hot soup was poored over the fried noodles. Rather special and not eaten in other areas of Japan. Yakisoba-no-Machi Kuroishikai is a community volunteer group committed to promoting Kuroishi Yakisoba and Kuroishi Tsuyu Yakisoba as regional brands (specialty dishes of Kuroishi) throughout Japan, and contributing to the revitalization and development of the region. Kuroishi Tsuyu Yakisoba is served with Kuroishi Yakisoba (pan-fried noodles) sprinkled with tsuyu (Japanese broth) and topped with deep-fried tempura batter and scallions. The thick and flat noodles take on a unique, chewy texture, especially when mixed well with Worcester sauce. Only after eating Yakisoba, will you realize the uniqueness of these pan-fried noodles. Please try Kuroishi Tsuyu Yakisoba--we are certain you will find it pleasingly delicious. It is one of the most expensive. Each is caught with a single line and then shipped in his own box (looks amost like a coffin), filled with ice. made from the benefits of the sea (fish roe, surume squid and kombu kelp) and the benefits of the mountains (radish, cucumbers). They can be heaped on a bowl of white rice to make a good meal (gohan no tomo). NEBUTA are the famous floats for the festival, made from paper with huge illustrations. Ooma (Oma) is the most famous port in the North. to keep warm after bathing. 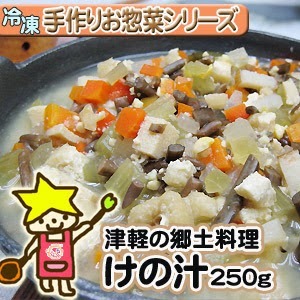 It is eaten with shooga-miso, shoogamiso しょうがみそ/生姜みそ miso paste mixed with grated ginger. popular for its many hot springs (Onsen). They are raised in hothouses with hot water pipes in the ground. The beans, kohachimame, are soaked in hot water and then grown for one week. The final sprouts are cleaned in hot water from the onsen ... They are very long and said to be healthier than normal moyashi. This has been done since 300 years, when the local daimyo ordered the production to bring it to Edo as payment. saba 鯖 mackerel is a speciality of the port town of Hachinone. Mackerel meat is shredded in very small pieces, fried with salt, spices, a lot of cinamon and yuzu juice, then put as an upper layer in the pie. The baker has to be able to cut and prepare the fish as well as preparing the apple pie. This is a newly created food from a girl of the local high school in Hachinohe town. 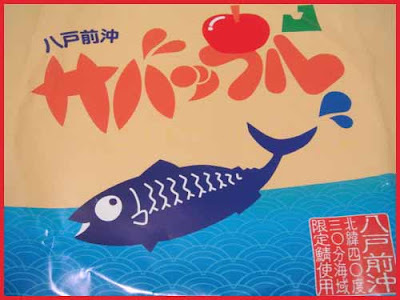 It won the first prize in a competition for "creative food", because it combines the two specialities of Aomori, mackerels and apples. She also thought of the name and thus became quite a celebrity in town. sukume サメすくめ a side dish, even served for the New Year. Eaten in winter in the Tsugaru peninsula. Aburatsuno-zame or Abura-zame あぶらつのざめ is found in great numbers in Tsugaru. Bereits in den Überresten prähistorischer Siedlungen in Aomori aus der Jungsteinzeit (Jōmon-Zeit, ca. 5000–300 v. Chr.) fanden sich Knochen von Haifischen, insbesondere der Arten Dornhai (Aburatsunozame) und »Sternen-Haifisch« (Hoshizame). Die kulturelle Bedeutung von Haifischfleisch für die Japaner belegt, dass seit jeher am großen Schrein von Ise, dem höchsten Shinto-Heiligtum, getrocknetes Haifischfleisch zu den Opfergaben für die Gottheiten gehört. Es gibt mehr als 250 Haifischarten unterschiedlichster Größen in den Weltmeeren. In den japanischen Gewässern wurden bis zu 150 Arten gezählt. Die Rückenflossen und die Schwanzflosse der Blauhaie werden am häufigsten verarbeitet. Der Yoshikirizame-Blauhai wird bis zu vier Meter lang und wiegt bis zu 200 Kilogramm. Die männlichen Fische leben in südlichen Gewässern um Japan, die weiblichen ziehen nach Norden und kehren erst wieder zurück, wenn sie ausgewachsen sind. In zoologischen Aquarien sind Haifische beliebte Ausstellungstiere. Kinder und Eltern können den scharfen Kiefern hier gefahrlos nahe kommen. Das große Aquarium im Sea Paradise auf der Insel Hakkeijima vor Yokohama hat sogar ein Grabmal für Haifische angelegt, das einmal jährlich von einem buddhistischen Priester besucht wird, der für die Seelen der im Aquarium verstorbenen Tiere betet. with agaragar kanten. People in Aomori put a lot of food in a jellied mix with sugar and eat it as oyatsu for the afternoon break. Here it is a salad with cucumbers, carrots and other vegetables, lots of mayonnaise and then ... sugar and agar-agar kanten. Udon noodles are also prepared as "udon kanten" うどん寒天. These kinds of preparations have started to become popular since 1975.
from Morioka, former Nambu province . Die berühmten Nambu-Waffeln kommen aus der Stadt Hachinohe, die in der heutigen Präfektur Aomori liegt, einst die Domäne Nambu. Früher dienten die Waffeln als haltbare Nahrungsmittel für die langen Wintermonate. In den Supermärkten von Hachinohe finden sich endlose Regale mit über 40 Sembei-Sorten, allein zehn davon mit Sesam. Meistens werden sie in kleinen Familienbetrieben von Hand gebacken, sodass jede Sorte ihren einzigartigen Geschmack erhält. Bei ganz einfachen Waffeln besteht der Teig lediglich aus Weizenmehl, Salz und Wasser. Die Sembei werden in Waffeleisen mit langen Griffen über glühenden Holzkohlen oder in einem elektrischen Heizgerät gebacken. Die Temperatur für Waffeln ohne Füllung sollte 130 °C betragen. Der Bäcker muss darauf achten, sie ständig zu wenden, damit sie nicht anbrennen. Mittlerweile wurden auch spezielle Maschinen zur Waffel-Herstellung entwickelt, die in Kleinbetrieben bis zu 3000 Waffeln täglich backen können. Die Bäcker allerdings müssen stets wachsam sein, da gleichzeitig Teig in die Formen gegossen und Waffeln aus den Formen herausgenommen werden mussen. Zur Geschmacksverfeinerung wird häufig schwarzer Sesam mitgebacken, der den Waffeln einen unverwechselbar aromatischen Geschmack gibt. Einige Hersteller bestellen das unverzichtbare Salz für den Teig sogar aus den Hochebenen von Tibet, weil dieses Natursalz dank seines Mineralgehaltes dem Gebäck überraschenderweise eine gewisse natürliche Süße verleiht. Für andere Sorten werden klein gehackte Erdnüsse mit etwas Zucker eingebacken. Andere Mischungen ergeben sich aus Äpfeln und Kürbissen, Süßkartoffeln und Shiso-Blättern. Auch verschiedene Getreidesorten werden beigemischt. Für einen herzhafteren Geschmack kommen Zwiebeln, Sojasauce, Chili, Tintenfisch oder Jakobsmuscheln mit in den Teig. Der bei der Herstellung am Rand herausquellende Teig wird nicht entfernt, sondern mitgebacken, und in Körben gesammelt. Viele Kunden lieben diese von den Japanern »Ohren« genannten Reststücke als Zutat für die tägliche Suppe. Sie kommen daher auch in den Verkauf. Ebenfalls als Suppenzutat, und zwar für Eintöpfe im Winter Senbeijiru, werden weiße Sembei gebacken. Sie sind sehr hart und lösen sich im heißen Wasser nur langsam auf. Weitere Zutaten dieses Eintopfs sind Hühnerfleisch, Wintergemüse, Pilze – und alles, was der Familie schmeckt. First made as offerings for the deities, later eaten by the family. 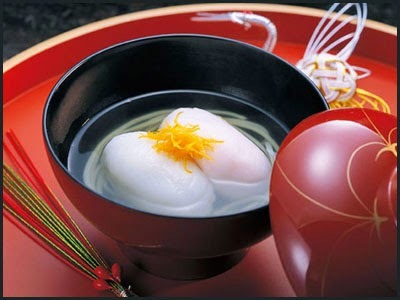 During the 12th lunar month (now december) daily offerings of these mochi and a bit of sake are made. Sometimes a bit of soy been an paste is used as filling and they are fried just a bit before eating.
. shitogimochi and クニチ，シトギマワシ Kunichi September 9 . 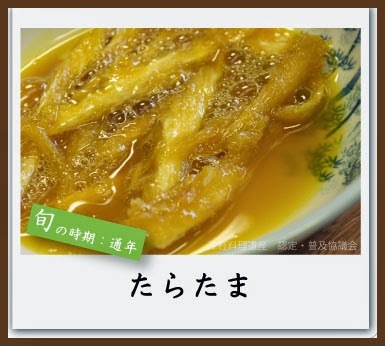 The dried fish pieces (hoshidara　干し鱈） are dipped in a bowl with a raw egg mixed with soy sauce. The fish is cut finely, bones and all, and mixed with miso, katsuobushi and eggs (almost like a hamburger) and then formed into small balls to be put in the soup. for dashi broth, when they are cooked later. They are made along Mutsu Bay at the Tsugaru peninsula. The head and entrails of small sardines are quickly taken off, the sardines washed in a bamboo basket until the scales are washed off and the back of the fish shimmers. Then they are "sewn" on a long bamboo stick, with the backbones all showing on the upper side, and grilled (broiled) over charcoal for about 8 minutes. Finally the grilled fish are dried in the sun and salty wind of Mutsu bay. In winter the fish are not so fat and just right for this preparation. For grilling they are stuck in the pebbles around the fire with a tilt, so that the fat does not drip on the charcoal but rund down the fish and babmoo skewer. They are the most expensive fish for dashi broth, one kilo costs more than 100 Euro.